Xia Boyu says he has dreamed of climb since 1975 failed attempt. 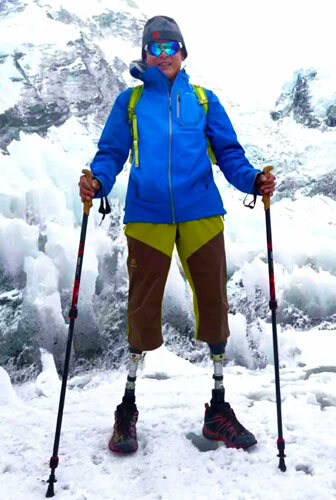 Double-amputee Chinese climber Xia Boyu is about 1,500 meters away from reaching the summit of the world's highest mountain. On Thursday morning, he reached a height of 7,283 meters on the 8,848-meter-high Qomolangma, also known as Mount Everest, according to a live broadcast on news portal sina.com. By the end of the day, the 65-year-old, who was born in Chongqing, was expected to have reached camp C4, where he failed in his first attempt to reach the summit 41 years ago. In 1975, a violent storm kept Xia — then a new member of China's national mountaineering team — at the camp at an altitude of 8,600 meters. The attempt also cost him both his feet to severe frostbite after he gave his sleeping bag to an ailing teammate. Since then, Xia has overcome despair, disabilities and cancer, and maintained strenuous physical training in an attempt to realize his dream. "(New Zealander) Mark Inglis climbed the world's highest mountain without legs. An 80-year-old Japanese also reached the peak. I believe I can climb to the top, too," Xia was quoted as saying during a radio interview in April. He said his confidence comes from years of hard training, interrupted for a time when he was diagnosed with cancer in 1996. Soon after recovering, Xia, equipped with artificial limbs, climbed four peaks more than 6,000 meters high in seven years. "Reaching the summit of Qomolangma is a dream I've never abandoned in the past 40 years," he was quoted as saying by Xinhua News Agency. Xue Guangwen, secretary-general of the China Mountaineering Association and a close friend of Xia, said, "He is optimistic and excited." A netizen from Guizhou province posted a comment on sina.com paying tribute to Xia and wishing him success. Another netizen, from Hunan province, said he had watched reports about Xia on TV, had been inspired by him, and also wants to climb Qomolangma. For his latest attempt, Xia received just one donation from his mountaineering partners during a departure ceremony. "I normally don't accept any donations. Instead, I sign a contract with enterprises, because I don't think I can repay the love people show me," he said.